Magnificent Panoramic Views!! Gorgeous Completely Remodeled Private End Unit!! Your own oasis... UNOBSTRUCTED PANORAMIC MOUNTAIN AND GOLF COURSE VIEWS FROM ALL ROOMS, overlooking the Wailea Blue Golf Course, with the slopes of Haleakala in the background. Extra large, 1200 SQUARE FEET, VAULTED CEILINGS, TWO MASTER BEDROOMS with a lock-off feature on one bedroom. VERY PRIVATE CORNER LOCATION with two lanai's, one in front, one in back, give this gorgeous unit a very open spacious feeling... You will not feel like you're in a condo. No views of other buildings or parking lots. The most private,serene setting in the entire complex! You can even see the herd of deer in the golf course in the evening after sunset, and of course,the sunrises over Haleakala are truly sublime! My WaileaOasis is very tastefully appointed in a tropical Bali theme, everything from the upholstery to the placemats! In 2010 we installed new gorgeous kitchen countertops as well as beautiful cherry cabinets throughout. A five-minute walk leads you to The Shops at Wailea, where you will find the very best in shopping and dining, along with some of the finest beaches in the world. And, Kihei town is just a few minutes drive with all the conveniences of 'the city' with a movie theater, grocery stores, more shopping, and more restaurants... Basically all you might ever need. The Grand Champions is adjacent to the famous, world-class Blue Golf Course and the Wailea Tennis Club. Discount rates are available to guests. This condominium is truly a rare find. I have lived in Maui for 18 years,and searched a long time for my Wailea Gem. (I'm originally from Colorado). I live in Haiku, Maui,on the north shore of the island, but when my condo is available, I enjoy taking a 'mini vacation' and spending time here tending to all those details that might otherwise be overlooked by out of state owners. Thus it will be maintained to the highest level. I hope you will have a chance to enjoy staying here as I do! I know you will love it!! My haven, your heaven!! PLEASE BE SURE TO VISIT MY OWNER'S WEBSITE. Just click on the link below... I'm sure you'll enjoy it!! Wailea is one of my favorite areas on the Island. If there's sun anywhere on the Island, it will be in Wailea. Truly an upscale resort, convenient to the best beaches in Maui. The Grand Champions is just a short walk to the beach, and the Shops of Wailea. Set away from the 'hustle bustle' of Kihei, yet just a few minute drive to all the restaurants and shopping that Kihei has to offer as well. For me, it has always been about the view. 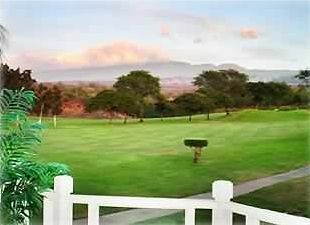 My unit is undoubtedly the most private, serene location within the entire complex, with the most spectacular views looking off to the Fairway, and beyond, the slopes of Haleakala,...unbelieveable peaceful setting. No view of parking lots, or other buildings. When you enter condo, you will understand how peaceful and quiet it is. My condo, the 2 bedroom corner end unit, has the largest 2 bedroom floor plan within the Resort. Being on the 2nd foor, the feeling of spaciousness is accentuated by the cathedral ceilings in both the livingroom and master bedroom. Perfect floor plan, as both bedrooms are on opposite side of the unit, offering maximum privacy. And the lanai is huge!! Perfect for relaxing and taking in the magnificent views. Being an on-Island owner, I visit the condo regularly. I love my sunny Wailea 'get-aways', as I live in Haiku, which tends to be one of the rainiest areas on the Island! When I visit, I make sure everything is in top shape. Fantastic Stay! Wonderful Host! Great Location! Maui is my favorite Island, and I always stay in Kihei or Wailea for easy access to diving Molokini. So I'm quite familiar with the area. And I have to say that the location of this condo was absolutely perfect. We walked to the Shops @ Wailea almost every day, to the Beach every other day, and stayed at the Pools on the property, or just sat on the balcony and watched the sunsets over the Golf Course and Mountain. The host was fantastic -- really accomodating. The condo had everything we needed -- AC units worked great, in every room, and it was super nice to close the sturdy doors and have silence. The rooms are pretty far apart so we could put our infant in one and not be woken up or worry about accidentally waking her up with our conversations or movement. What an absolutely wonderful condo !! Very tastefully decorated and had everything we needed! We loved being close to beaches, shopping and great restaurants. The beach chairs and towels were much appreciated ! The privacy with view of the golf course and treed ravine were definite pluses. We would definitely stay in your home again! Thank you so much! Best unit we have stayed at yet! We loved this unit, there was plenty of room for our kids and we had a close walk to the pool. The updated touches, with beautiful tile and granite counters made the unit feel so nice. We will definitely stay here again if given the opportunity! I hit a home run when I rented this condo. It was exactly as described. Each morning we woke up to unobstructed (no clouds) beautiful views of Haleakala. In the evening we would have our cocktails on the lani and on two occasions we followed some locals with their dogs up the golf cart path to see fantastic sunsets. Sherrie was always responsive and very accommodating. Mahalo, Sherrie! Located on a world-class golf course, this two bedroom condominium is not only beautifully appointed with artwork and furniture from Bali – it’s also very comfortable. Wailea is a special place for golfers and non-golfers alike. Amazing courses, outstanding beaches with remarkable restaurants are all part of the Wailea experience -- and are located just minutes from this beautiful condominium. The two-bedroom condo is very spacious with a porch overlooking not only the golf course, but beautifully maintained gardens below. Happy hours on Sherrie’s Wailea property porch will be long remembered! We were also able to walk from her condominium to several outstanding restaurants in the evening. During our stay in Wailea we also attended the Maui Film Festival – we viewed great films under the “real” stars with other screening events located on nearby beaches for a “toes in the sand” experience! Additionally, Wailea offers outstanding beaches -- some with nearby 5-star restaurants and others more remote. In addition to golf, Wailea also has great shopping, beautiful ocean beaches and more. A vacation in Sherrie’s Wailea two-bedroom condominium is truly a remarkable and memorable experience for every island-destination traveler! Aloha! Great golf getaway! Weilea has the best golf on the island! Close to beautiful beaches, golf, tennis, shopping and restaurants. Every thing you could possibly need has been provided. Clean and comfortable! We would definitely return!